Whether you’re going away for few hours or few weeks, space and weight are major factors when selecting your travel equipment. Minipresso has been designed to be the smallest, lightest and most versatile handheld espresso machine. Minipresso’s ease of use is derived from its innovative design. With the help of the semi-automatic piston, small quantities of water are injected into the coffee adapter. After a few pushes, the optimal extraction pressure is achieved and a rich and bold espresso is extracted. 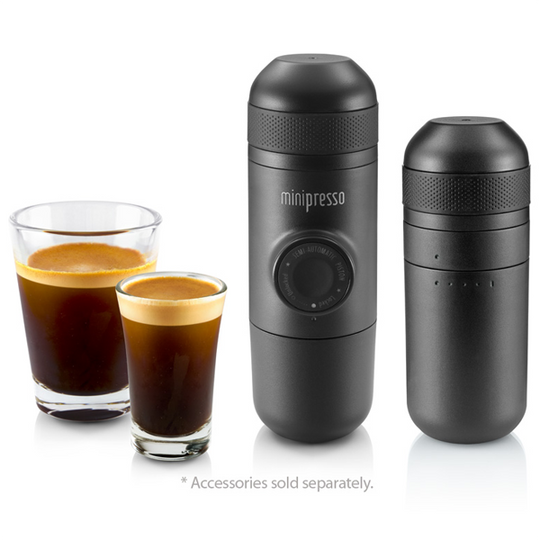 Minipresso doesn’t require compressed air, N2O cartridges or electricity for its operation. Hand operated, you are free to prepare coffee drinks that you love. Water tanks of different capacities are available so you can enjoy multiple espresso types, ranging from ristretto to caffè lungo.